The 2013 Mazza Museum Weekend Conference has begun! A ballet dancer until she was thirty, Robin Preiss Glasser, has spent her entire life expressing her artistic self without words. 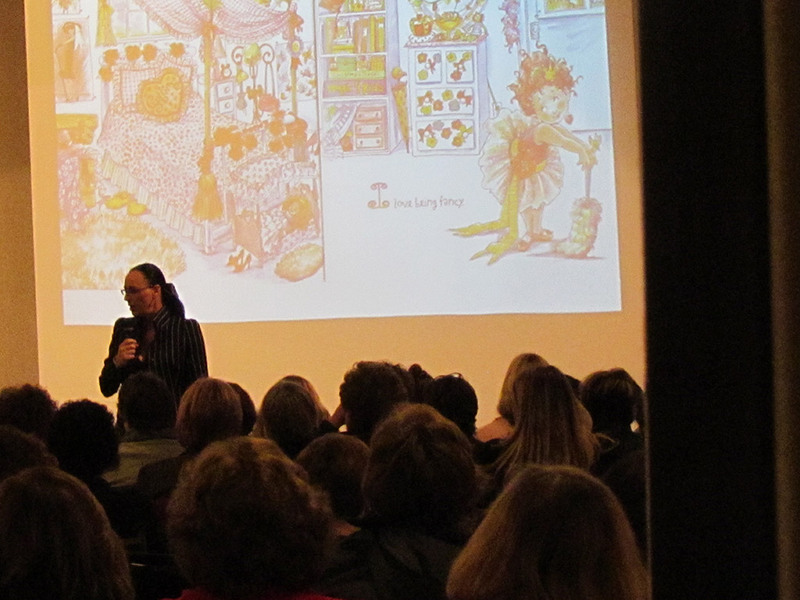 As the acclaimed illustrator of many books for children, including the beloved Fancy Nancy series, she is still doing just that. In an auditorium crowded with book-lovers of all sorts, Robin shared with humor her not-so-surprising transition from ballet slippers to – well, um – ballet slippers. Her journey included being a copy artist (in which an illustrator emulates the style of another for the purpose of creating a sequel) and creating a series of patriotic books with Lynne Cheney. And then along came a little girl named Nancy. And everyone could relate. Don’t we all know a Fancy Nancy? Or two? Don’t we all own a Fancy Nancy book? Or two? Robin had done many Fancy Nancy books before she realized that the precocious Nancy had been imitating her all along. Fancy Nancy leaped, and danced, and wore tutus just as Robin had done in her earlier life. And, don’t we all love to dress up sometimes? Why, just last week an author/speech therapist I know showed up for work as her favorite picture book character. 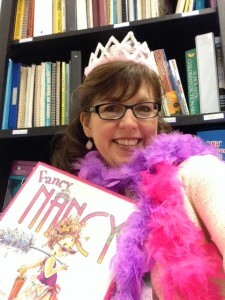 Author Jane O’Connor used words to create the character Fancy Nancy. And then, Robin Preiss Glasser, in her own wordless way, breathed life into Nancy, making her the little girl we adore. What a way to kick off the 2013 Fall Mazza Conference! It was tremendous!